The North Otago Times, reported “A body of over over 29 natives were being put through their facings in July 20 ( 1871), by Lieutenant Woods and the fact of discplining them in the white man fashion caused much indignation”. 1871 image? This unsourced image shows about 29 soldiers at a place that looks like Levuka. It was published by Jane Resture (see links at left). The two men at the right are perhaps Woods (later Prime Minister), and Hennings or Sagar. Public meeting at Levuka: In the evening a public meeting was held in the (Levuka) Reading room, presided over by Dr Ryley. Opinion were expressed and resolutions passed to the effect that training them to act in concert was a dangerous and impolitic measure, and fraught with great danger to the white residents of Fiji. A delegation, consisting of Dr Ryley, Messers E. S. Smith, Cussake, Sumner, Jackson, Ross and Nicholls, was appointed to wait upon Mr Woods and protest against his action. The proceeded for the purposed of interviewing him, but he was “out;” and, expressing their determination to see him in the morning, they departed. Office of Fiji “Government” not recognised: Accordingly the next morning they waited upon him. Mr Burt as “Premier” wished to meet them; but stating they did not not recognise the “Ministry” they insisted on seeing Mr Woods, who appeared, Messrs Hennings and Sagar entered soon after and took part in the conversation. Mr Woods threw to onus of his action on the government, and stated that it was intended to drill some men for the purpose of acting against the Ba Mountaineers. NZ war example – ‘natives with guns‘: The deputation argued the drilling of the natives was dangerous in the extreme and instanced New Zealand. It was replied the Ministry intended to subjugate the mountaineer and did not recoginise the right of a public meeting to control their actions If any were dissatisfied with the actions of the Government they could leave the country. The deputation again urging the discontinuance of the drill, then withdrew. 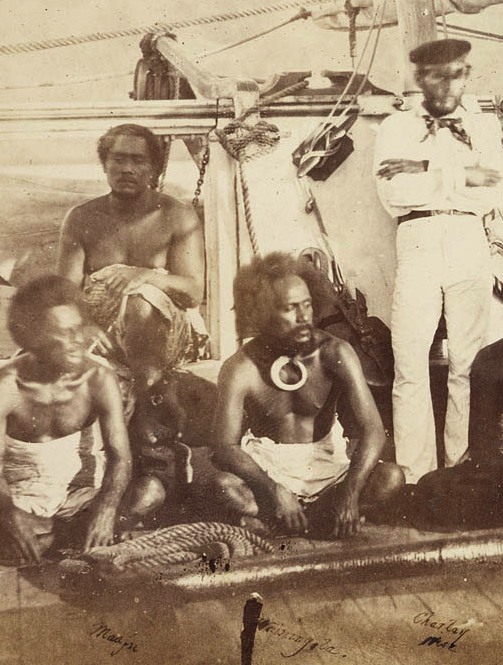 Large meeting assembled in the Reading-room: In the course of the day a letter was despatched to the chairman of the committee, stating that the object the Government had in view of drilling the natives was to get their cooperation in the expedition to capture the Ba murderers. In the evening a large meeting assembled in the Reading-room to the hear the report of the deputation, Dr Ryley in the chair. The letter was read, after which Mr Manton proposed, seconded by Mr Rogalsky, “That this meeting still is off opinion that drilling the natives is highly injudicious, but at the same time, while desiring Mr Woods to desist, wishes to express a hope that nothing done at this meeting should in aany way delay active measures being taken against the Ba murderers”.